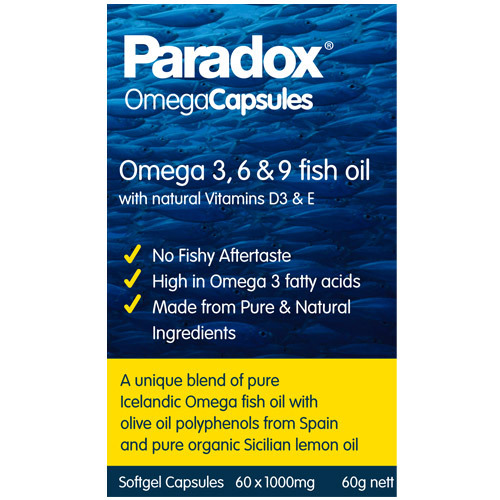 Paradox Omega 3-6-9 & Vitamin D3 is an unique blend of pure fish oil, powerful by polyphenol antioxidants which can be found in extra virgin olive oil. These antioxidants protect the omegas by avoiding the oil from oxidising and becoming fishy, and may help with the maintenance of vision, skin, heart and joint health. Omega 3 fatty acids are very fragile and when they break down, are less effective. Paradox brings together the best from Mediterranean and Arctic diets to create an unique blend scientifically proven to be more stable for longer. Paradox delivers ingredients essential for eye development. Paradox contains essential fatty acids which may improve the nutrition of the skin and associated inflammatory conditions. Paradox delivers the ultimate balance of ingredients to improve HDL, LDL oxidative stress and cholesterol profile. Paradox may help reduce pain, stiffness and inflammation associated with joint health. Pure fish oil, pure extra virgin olive oil, pure organic lemon oil, fish gelatine bp, glycerol bp. Adults: Take 1-3 capsules per day. Children 12+: Take 1-2 capsules per day. Below are reviews of Paradox Omega 3-6-9 & Vitamin D3 - 60 x 1000mg Capsules by bodykind customers. If you have tried this product we'd love to hear what you think so please leave a review. 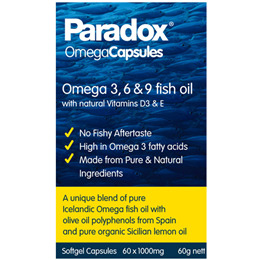 Paradox Omega 3-6-9 & Vitamin D3 is an unique blend of pure fish oil, powerful by polyphenol antioxidants, which can be found in extra virgin olive oil. These omegas may help with the maintenance of vision, skin, heart and joint health.